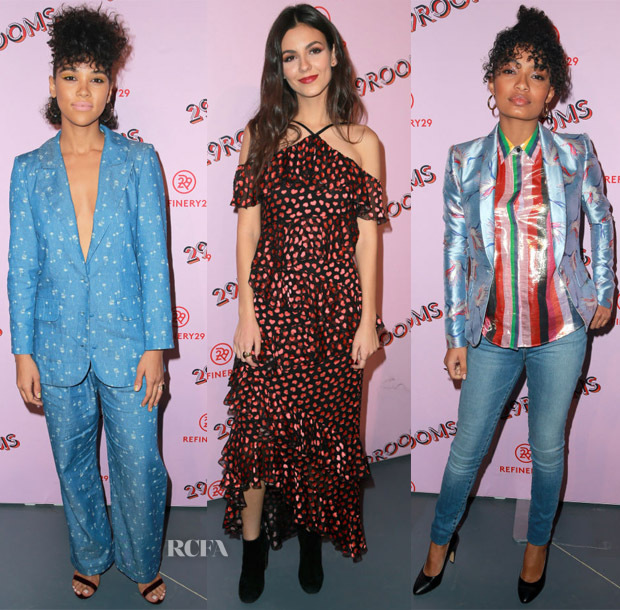 The Refinery29 ’29Rooms Los Angeles: Turn It Into Art’ opening night party saw a host of lovely ladies in attendance on Wednesday (December 6) in California. Gabrielle Union: The ‘Being Mary Jane’ actress wore a TOME Fall 2017 bomber jacket and corseted shirt, plus some check trousers. I’m usually a big fan of Gabrielle’s style, but I couldn’t get on board with this look. I think the shirt is really the chink in her armor here. Margot Robbie: With those power shoulders, it’s quite clear that Margot was paying homage to the 80s in this sleek Saint Laurent Spring 2018 look which she styled with Pierre Hardy ‘Laser’ pumps. Janelle Monae: Did Janelle’s invite say come as art? That can be the only explanation for this Kaimin leather dress and Nange Magro // Dead Lotus Couture latex headpiece. You gotta admire her for committing to the look if nothing else. Lily Collins: Even with the studded vest, Lily still presented an uber sweet vibe in Prada. Kat Graham: Shirting has becoming somewhat a trademark of Monse and this Spring 2017 long-sleeve pleated shirt demonstrates why they have reached a heralded cult status. I love how Kat made this look her own with a Mugler asymmetric skirt with a coordinated metal choker. Angela Sarafyan: You may see swatches of fabric, I see another gorgeous look from the highly underrated actress. I love this Adeam Resort 2018 asymmetrical tunic and deconstructed pleated trousers. Alexandra Shipp: I love the relaxed and cool vibe of Alexandra’s Alcoolique Resort 2018 linen suit. It’s a look which sells itself, so Loriblu velvet sandals and Lilou jewels were all that were needed. Victoria Justice: The actress always presents such colourful, charming looks and this Alice + Olivia Resort 2018 dress was no different. You may remember that Heidi Klum wore this same dress back in August. Yara Shahidi: The ‘Blackish’ star showed that she not afraid of colour and clashing prints at this event. Sadly, the Alice + Olivia Spring 2018 blazer and shirt don’t work together for me. I would’ve replaced the striped shirt with a simple plain top. J Brand ‘Carolina’ jeans and plain pumps complete her look. Gillian Jacobs: With those glasses and her MSGM Pre-Fall 2017 argyle sweater, it’s easy to label this look geek Chic. Demi Lovato: I like how Demi tempers the fiery yellow snakeskin elements of her look with green Diane von Furstenberg wide leg trousers. Emmanuelle Chriqui: Of all the looks, Emmanuelle was clearly the only one in a Fall state of mind. This floral velvet suit feels so decadent, yet so relaxed when paired with the graphic t-shirt.